I’ve shared about how I’m not doing year round school this summer. We’re actually taking a break while still sneaking in a bit of learning. However, I am spending my summer doing something entirely different. I’m taking time for self-education. I’m doing things to help me feel more refreshed and motivated for a new school year. One of the major ways I’m preparing for next school year is reading books and articles to encourage me as a homeschool mom. Today I’m going to be sharing about my latest read and why you might want to add it to your summer reading list. 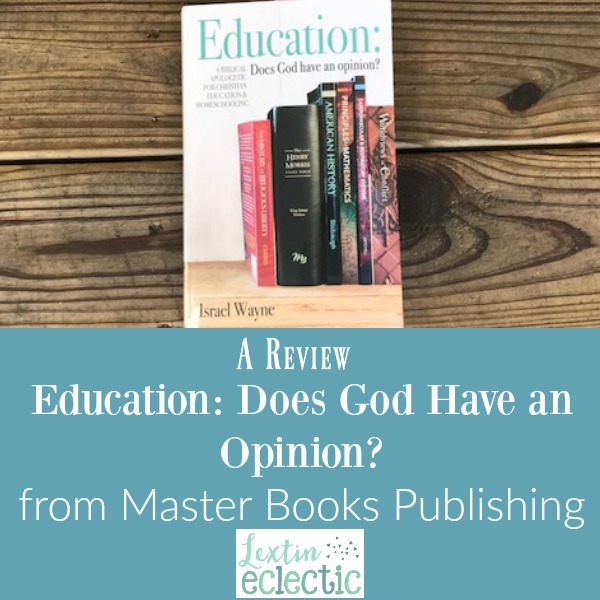 I was given the chance to review Education: Does God Have an Opinion? from Master Books. Before I jump into an outline of the book’s contents, let me just say that I thoroughly enjoyed reading this one. It challenged me. It made me think. It made me revaluate. It made me emerge with a new vision for our homeschool. This book was both thought-provoking and encouraging. I’ll admit, that after a few chapters I had to put the book down and step away for a bit because the content is so deep and rich. I’ve learned about the various worldviews, the history of education, as well as the rules for teaching logic. It’s a lot of information, but so worth reading! If you can’t tell, I’m a huge fan and I’ve been recommending it to many of my friends. It’s really a must-read for any Christian homeschool family. It will give you a fresh perspective on your homeschool, help you solidify your reasons for homeschooling, and give you an outline for how to cover each subject from a Christian worldview. So, now that you know my opinion on this book, I’m going to dive in and share more about the contents. This book is divided into two main sections: The Apologetic and The Core Subjects. In the first section, the author shares the history of education with the conflicting worldviews of modernism, postmodernism, and a Christian worldview. He includes advice to helping families navigate the various worldviews while staying true to Christian values. The next chapter discusses the problems with government schooling. The author addresses the argument of children being in public schools as salt and light. I will admit that this was probably my favorite chapter. It brought up several issues that I had not thought about and had a great argument against Christian children being placed in the public schools as a witness for Christ. But what about socialization? It wouldn’t be a book about homeschooling if this question wasn’t answered somewhere between it’s covers. I really enjoyed the author’s thoughts about socialization and the problem of peer dependency. He argues that the people who spend the most time with a child earn his allegiance and loyalty. As homeschool parents, we must remain the primary influence on our children so that we can help them look to Christ as the source of their security and identity. The next chapter discusses Christian schools as a choice for families, outlining some of the positives and negatives about that option. While the next chapter dives into the option of homeschooling and how to define your objectives and goals. These chapters completely shifted my paradigm as to how I approach my homeschool. The last chapter in this section is about having a biblical worldview education. The author outlines 6 elements of a Biblical worldview and includes a guide to have discussions about worldview topics with your children. I found the first section to be so encouraging and convicting. After finishing it, I started to reevaluate our homeschool mission statement and change my plans for the upcoming year. I’ve realized that I often lose focus on my main objective – which should be to disciple my children and help them grow in their faith. The second section is more like a handbook on how to cover each subject effectively from a Biblical perspective. I’m keeping the pages dog-eared with my multiple highlighted sections, so I can refer back to them as I plan for a new school year. This section is a valuable resource. In this section, there are chapters on curriculum, logic, mathematics, science, philosophy, social studies, the arts, language arts, literature, history, and government. These chapters contain information about how modern and postmodern societies approach the subjects as opposed to a person teaching the topic from a Biblical worldview. The author provides advice for how to teach the various subjects as well as the Biblical purpose for teaching each one. Does God have an opinion on homeschooling? Yes, I believe He does. Through reading this book you can discover God’s purpose for your homeschool while receiving encouragement and practical advice on how to teach each subject. Get your own copy from Master Books for $11.19 and enjoy a new perspective on your reasons for homeschooling as well as your methods for teaching each subject! This sounds like a really interesting read! I love to read homeschooling books, this will be going on my list! We do homeschool all year, but take significant breaks. We tend to use the summer as our science intensive – as in that is all we are doing besides free reading and playing outside. I hope you enjoy the book. I’m so glad I added it to my summer reading list! I love the idea of doing a science intensive during the summer. One summer we did an art intensive and that was really fun!